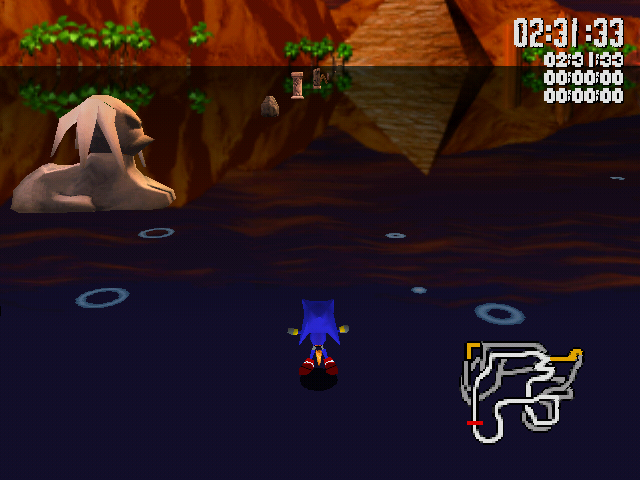 Those of you that have done the out-of-bounds tricks in Sonic R are probably aware that there are uncollectable blue balloons hidden in really weird, out-of-the way places. The even fewer of you who have decided to swap the files for different tracks around (so that, for instance, Regal Ruin has the track and collision data of Radical City) will have noticed that even more balloons appear, in totally random places. And if you play this franken-level in the Balloon Time Attack mode, you'll notice that these balloons aren't even used by anything! So, what are these mysterious blue balloons? Simple: the in-bound ones are leftovers from the Sega Saturn version of the game. In that version, the balloons didn't animate or have random colors like they do in the PC version. 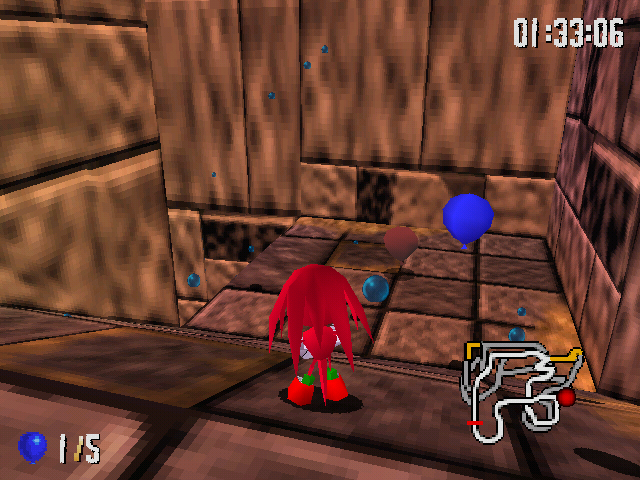 They're just static blue balloons, placed exactly where they are in the PC version's track files. I imagine the out of bound ones were used by the devs as a template to copy/paste from, and placed far out of bounds where nobody can see them. This is done with many objects in the game. For instance, take this screenshot from far beyond the outskirts of Regal Ruin. So now two question arises: where do the real balloons come from, and why can't I see (some of) the fake ones? I'll answer the second one first, because why not. Here's the relevant code, in all it's glory. Once EAX and ESI are loaded, we multiply EAX by 4 and add 0x500A18 to it. This makes EAX now a pointer to some area in memory. In this particular case, it points to a location in SONICR.EXE, specifically offset 0xEBA18 + (course ID * 4). This means you could open a hex editor, look at addresss 0xEBA18, and edit this data. And ECX is loaded with 0x0FFFFFFFF, which is used as a "end of data" indicator. Once all our registers are set up, we enter the main loop. This repeats while EDX != 0x0FFFFFFFF. EDX, in this case, is whatever EAX (our pointer to the location in the EXE) points to. Every go through the loop, we increment EAX by 4 so that we don't perpetually repeat ourselves. Once we've comfirmed that we're not at the end of the fake balloon data, we can start hiding balloons. To do this, we multiply the value of EDX by 0x44, and store it in EBX. We then set the value of (TrackGeometryOffset + FakeBalloonData + 0x2C) to 0xFFFF. That is, it sets a word in the in-memory representation of the track's part so that the part doesn't get rendered. And, because it's a loop, it jumps back to the start where we dereference EAX again. In summary, the game reads a list of parts and then marks those parts as "do not render". ...I made that sound really complicated, didn't I? Also, I'm not really sure why only some of the balloons are hidden or why they weren't just removed from the game altogether. I suppose whatever level editor tool they used had a "is part visible?" checkbox that makes this super duper easy. But I can only speculate. Where do the balloons come from? I'll skip the ASM analysis for this one, because the ASM here is much, much messier and not really worth explaining. 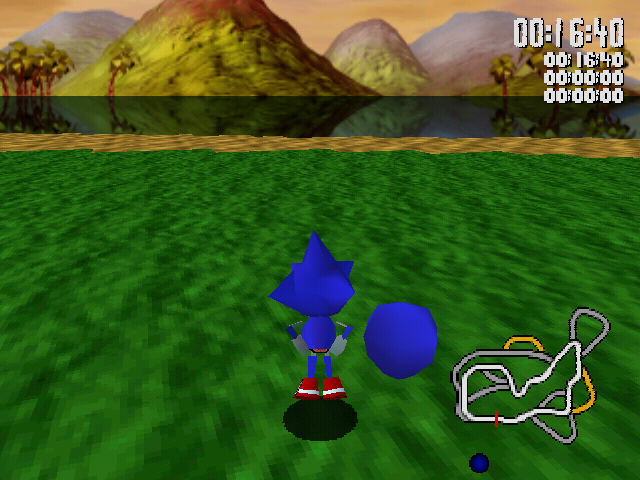 Each course in Sonic R has 17 balloons defined. These are used in the Balloon mode for Time Attack and Multiplayer. To help you visualize (and to help me make sure all my info is accurate), here's an interactive balloon randomizer. Note that it will probably be hideously broken on phones and really old browsers. Also the balloon positions might not be 100% accurate, just due to how I got the map pictures.